We are awakened at the sound of raindrops at first light. Instinctively, we spring into action to close the ports and hatches. There is something comforting about the sound of rain drops on deck. 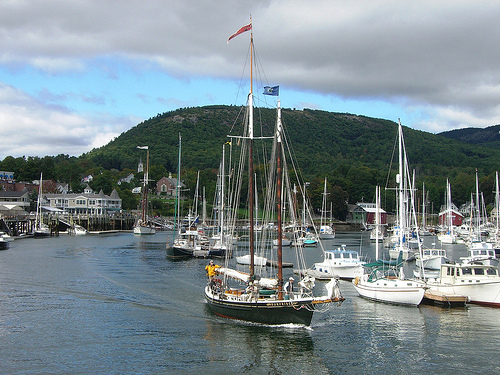 Rain or no rain, Camden is one of the most picturesque harbors anywhere. The Windjammer fleet is based in Camden. 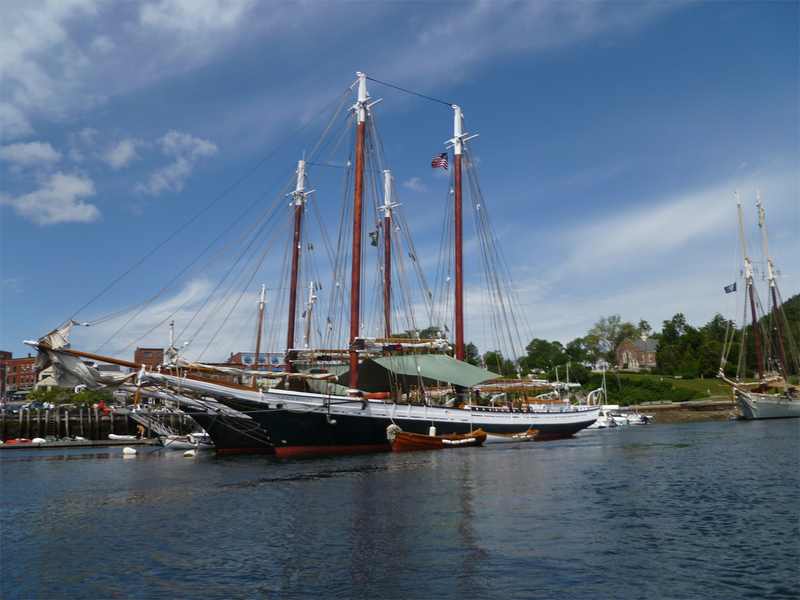 On Sunday morning, passengers board these vintage sailing vessels for a week-long cruise of Downeast Maine. By 10 AM, the skies have become clear. It will be another hot day in Camden. After lunch, we hike from sea level to 1300 feet as we summit Mount Battie. The views from the top are well worth the climb. We spot Cutter Loose, a distant speck in the harbor. 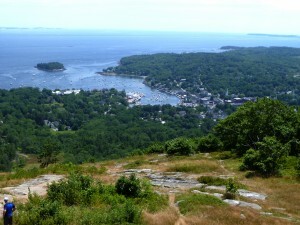 The outline of Cadillac Mountain on Mt. Desert Island is clearly visible on the horizon, as are the hundreds of islands in between. This special place is truly a sailing paradise. The wind blows most every day (strongest in the afternoon) and there are hundreds of harbors, coves, towns and passageways between the islands to explore. We will dedicate the next three weeks to the pursuit of relaxation and discovery. A stop at the bookstore produces an apology on the part of the sales clerk for yesterday’s misinformation. This seems sufficient. Three months ago, I may have been more direct with this character. But the God’s honest truth is that this liveaboard lifestyle has a mellowing effect on one’s demeanor. Anything short of a grounding or other life-threatening situation just isn’t worth becoming agitated. We are now confirmed for tonight’s performance of Thirty Nine Steps at the Camden Opera House. The cast of four is very professional and the clever use of minimalist props add interest. However, the murder mystery plot is weak and silly. The performance was billed as an Alfred Hitchcock whodunnit. But in reality, it is slapstick humor in the style of Monty Python. The significance of the title is the only mysterious aspect of this production. It is 10:30 PM by the time we return to Cutter Loose. The sky is clear and moonless, revealing an infinite number of stars and constellations. The harbor is eerily quiet and dark. As we dinghy towards our mooring, there is an absence of activity in the harbor. There are no cockpit conversations or warm lights glowing in the cabins of the moored boats. This seems rather unusual for a Saturday night in the sailing capital of Penobscot Bay. The weather forecast for tomorrow is for lower humidity with high temperatures in the seventies. 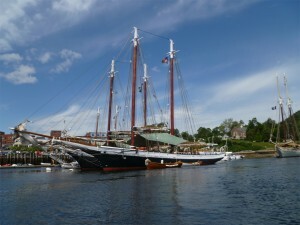 This is more in keeping with our expectations for a summer cruise to Maine.